It's that time of year again when we love to sit outside and enjoy the warm weather. What better way to light up your evenings, than with elegant outdoor lighting. I have found some very interesting ideas on the web, and will share them here. Have you ever felt that you have to rush and go indoors instead of enjoying the beautiful breezy outdoors during late evenings just because it is dark and you don’t have sufficient lighting? Or do you and your guests often struggle along your walkway while it is dark? Light is very important in all forms whether it is during the day or evening, or whether it is indoors or outdoors. All homes usually have sufficient indoor lighting, but it is the outdoor lighting that needs to be improved because your beautiful outdoors will otherwise just be day time attractions and useless once it is dark. For this one must make efforts to match the correct type of light to elevate your outdoors. Artificial light these days comes in different forms, glows, colors and quality. It is necessary to determine the correct quantity and quality of light to project the beauty of specific areas and most of modern lights are designed to give best results. Besides, a good modern outdoor lighting enhances the mood whether it is in a residential setup or office. Not only will lighting up your exteriors help you elevate them with a modern touchof elegance, but you can also plan a special get together with friends and family outdoors. Your lawns will thus become the perfect party place where you can enjoy the fresh air rather than sitting indoors. 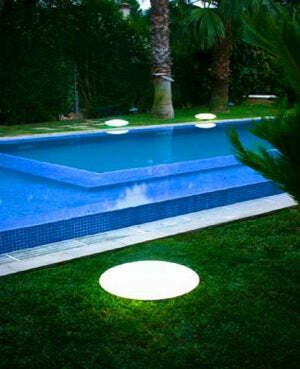 There are many different types of modern outdoor lighting to choose from. There are lamp posts or the walkways, wall hanging lights and lamps for gardens or porches, outdoor ceiling lights, pendant type lights, LED lights and solar lightings, string lights and various lanterns available. You can also choose the underwater modern lights for your swimming pools to attract lot of visitors and make it look unique. The modern lights are available in many different price ranges and they will blend perfectly with any type of ambience from cottages to castles. The modern lights are not always wall mounted or like posts, you can also choose from the many small table lamps or corner lights and make an aesthetic arrangement to add elegance to the outdoor ambience. You could also choose from the small bar lights, cocktail lights for pool sides, candle chandeliers, torch anchors, floating candles or solar lights for ponds or bird baths etc which are a part of modern outdoor lighting. Outdoor lights are usually very helpful for many reasons other than just adding to the luxurious decor. They help light the pathway to provide safety while walking through it. There are some modern lights that help keep insects away. This designer modern outdoor lighting can focus on prime areas in your outdoors so that the beauty of your furniture piece or a specific area can be accentuated. The sizes also can be selected as per the size and requirement of light in the outdoors. Thus with so many wonderful features and such a huge variety, these modern lights are sure to set your mood right and coax you to spend more evenings outdoors. The type of lights you choose is completely up to you and, because there are so many options available, you can easily find one that matches your family’s taste, personality, and style. Imagine how much more convenient it will be to not only have the convenience of modern outdoor lighting, but also how much more aesthetically appealing they will make the area. Most of them are very versatile and will go with any type of furniture and décor your home has—even if you decide to change it up. Take a look around to explore the abundance of options available to you. You won’t be disappointed. These compact, ultrabright, low voltage LED lights make decks both appealing and accessible after dusk. They mount flush to any surface and are ideal for pathways, stairs, doorways, and step-downs. Versatile and easy to install, recessed lighting is a simple way to add a dramatic effect to your deck. Lights come eight to a package with transformer and light sensor included. Additional two-pack add-on kits and extension wire are available separately. Lights can be spliced into a low voltage system using a cable connector. To learn more about installation, check out the video or download the installation instructions by clicking here. line-up of fixtures are produced by young, creative, distinguished professionals who share common goals of providing coherent and innovative products. 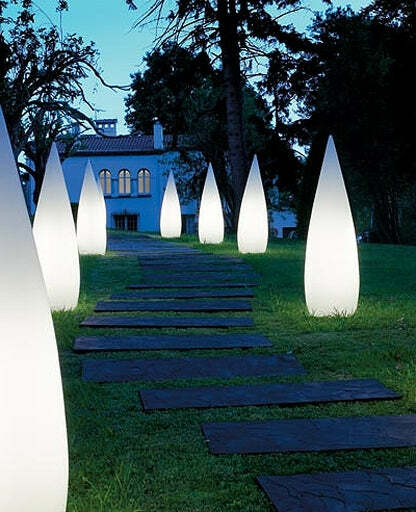 The Kanpazar 80 outdoor floor lamp by B.Lux is designed by Jon Santacoloma and made in Spain. The Kanpazar 80 outdoor floor lamps are UL listed and have a smooth white frosted finish and made from vandal-proof UV resistant polyethylene. The newest idea from Spain. 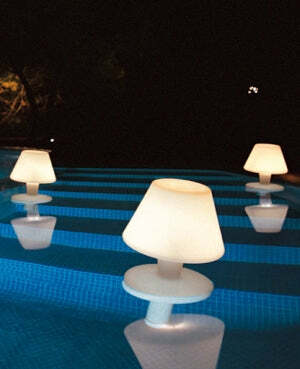 These floating pool lamps are rechargable and a highlight on every pool party. The light is waterproof and can be dived. The Blow Outdoor Lamp light by Almerich was designed by Estudio Almerich. This outdoor table lamp is portable with a molded polymer diffuser. Blow complies with outdoor requirements for luminaries and may be put in a garden or on a terrace. The metal parts are aluminium with a black epoxy finish. Choose From More Than 400 House Designs and House Plans We offer house designs in a wide range of styles and sizes. Some of our more popular house designs include European-inspired Georgian and Palladian homes, English Manor house plans, Tuscan-style Italian villas, French chateaux, and Colonial house plans. Our Tuscan-style villas range from 1800 sf to 13,600 sf. Our Newport Classics house designs are gentrified New England-style cottages that range from 1500 to 5000 square feet. Our starter castles, mansions and estate homes are designed in the grand tradition of some of the most impressive homes in the world. Please feel free to search our house designs or browse our photo gallery to get a sense of the many styles and types of house designs we offer. Our plans have been built around the globe, from Canada to Dubai, and one plan could be just for you!